In the great struggle with ball-point pens, one of the very points that fountain pens must concede is that of free alignment. A ball-point does not care which way up it is when you start writing, while a fountain pen cares a great deal. Even such oddities as the Parker 180 and the Sheaffer Stylist, which can write either way up, will only take so much rotation. Sailor developed a bit of a chimera called the Trident, which would in fact write from just about any angle through the expedient of having three v-shaped points leaning against one another. The problem with the Trident is that it offered ball-point convenience at a price which for the most part only people who wanted a decent fountain pen were willing to pay– the convenience comes with stiffness, which is an affliction of the ball-point. Which brings us at last to the pen under consideration. The Hero company makes some pens which are not utterly… I shall say “inexpensive”, for while some are cheap, others are good enough to rise above mere cheapness… but they have a very clear sense that their market lies in affordable pens. A low-cost fountain pen that writes at all angles? Right up their alley. 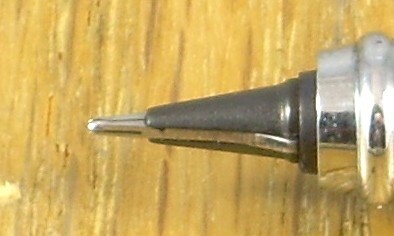 Rather than the multiplicity of points seen in the Sailor, Hero went with a fairly clever approach– use a flat point like the the Parker and Sheaffer items mentioned previously, and cut a secondary slit in it perpendicular to the main one, as though trying to make two flat points out of one. This gives four tips, each reasonably close to a source of ink, so there’s no more scribbling to start an ink flow than with a ball-point. It… works. It’s unexciting, but it reaches its goal of inexpensive convenience, and I can’t fault it for the unexciting performance that comes along with that. I maintains one point of superiority to the ball-point, in that one gets to choose the ink it lays down, rather than being faced with a very limited choice of goop (I lift a line from a rather good blog, now gone from the world: “Any colour you like as long as it’s hideous”). The model name has been changed since this one was produced, so if you seek one, look for the 360 (oooh, that’s twice as good as the Parker!). This also may be to avoid confusion with the Hero 100. Production Run: As is the case with pretty much all the Heros, I’ve no idea when it started (since 1980. but the looks) and only a foggy notion of the end (relatively recently, replaced by the similar 360). Cost When New: Likewise unclear, but not very much. Size: 13.3 cm long capped, 14.5 cm posted, 11.6 cm uncapped. Hero 001: It's slightly better than a ballpoint! At the ultimate extent of my camera's magnification, the sideways slit can just be made out.